JubJester had the most liked content! Roller coasters, Kings Island, Cedar Point, Carowinds, Cedar Fair, Major League Baseball, and more. "Ask for a Giga, it gets delayed a year." The Beast was the first "big" coaster I ever rode. 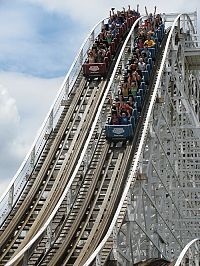 For a couple years prior to that day I could never get myself to ride any of the big roller coasters. For some reason that day, I "forced" myself to ride it. Once I hit the second lift hill, I was completely speechless. I immediately knew once I got off that ride, that I'm going to be addicted to roller coasters. It's funny when I went to get right back in line, they had just shut down operations due to incoming rain. My second ride was right after the storm passed, and it was absolutely flying on the track. It was so intense, especially it being my second ride ever. That is correct. Top level by the left field foul pole. It's a really cool area for a great price. Giga Confirmed! Once I saw this, I knew I had to post it! @Gordon Bombay @Kayla_Uzlik I've blocked that guy on Twitter. He just uses his Twitter to get into arguments. If you prove him wrong with stone cold facts, he won't accept the fact he's wrong. Apparently according to multiple people and a review on Google he creeps on women on Facebook and social media. He's also spammed Kings Island and the PR guys to try to get into media events. Kind of like @Oldschool75 said, you're better off blocking that POS. That's advice for everyone here. He's done plenty wrong. @Oldschool75 Can we just drop it? That post was not necessary at all. Unless you're trying to keep the conversation going. Ridiculous. Let's move on: I love the balconies. I sense a few on here will be stopping there on Preview Night/Opening day to check out the new fountains! @fryoj You can still talk about things without needing drone or plane photos. What would you gain in discussion from seeing a flat piece of land? Nothing. Everything will be okay without seeing it. KI officials watching the giga speculation on social media: I always think of this GIF when I read about speculation on a giga. Yes actually. It's been a big problem. A lot of the paint they use inside the buildings to spray the track have gone missing. They caught some of the "suspicious track" you mentioned on the security cam. They seemed to be scoping out the place from the tree line before the paint went missing. It will be interesting to see what will happen. IP. Shoot the Mods a message. They can also ask Mr. Koontz himself. Exactly. The direction they are going is great. If the service comes around to meet everyones expectations it would enhance the park a lot. Also will save the headache of reading some people's constant negativity on here. Which is the real reason I want the service to be better. I think it was to small of an area. If you remember when they had announced Wasteland we all thought it would of been in front of Mystic Timbers. Which I think would be a better location. If they add more props, and more staff it will be great. The dorms, I'm sure, will help that. They were usually spread out. When it's really foggy it's even better. Like @chad_1138 said, I liked Nightmare Alley better. Wouldn't suprise me if they get rid of it and add something else. Wow! Thank you for this valuable insight.